ALIEN age 11 - Comic/Graphic Novel and Blog: "Not the alien!" 1982? It won't be long now. I wonder if I'll feel the same sense of loss when this comic finishes as I did when Star Wars age 9 did? I don't think so but it's a hard thing to finish a big project. 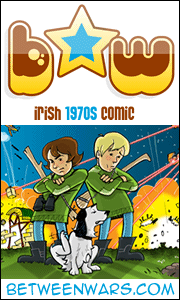 Do you know what this comic has forgotten all about? Blowing up the Nostromo! 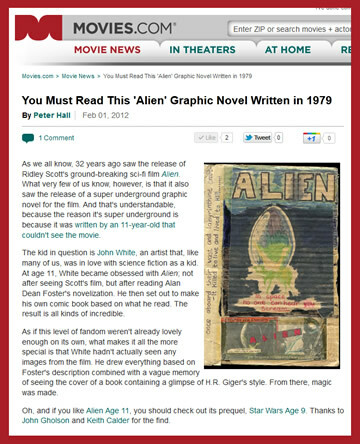 It's a key suspenseful element - and one that also prepares the viewer for the shock discovery that the alien is onboard! This is also the first time that she suspects that it is taking the only means of escape from the Nostromo with them. She doesn't run back to stop the Nostromo self-destructing. It would have been great to cancel detonation and jettison the beast with the shuttle. 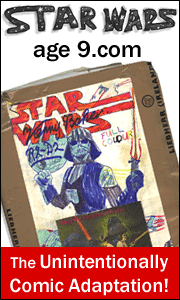 Ah, well - I was only 14 or so, and understood very little of such plot devices! A crying shame considering that I sat through English class like everyone else. 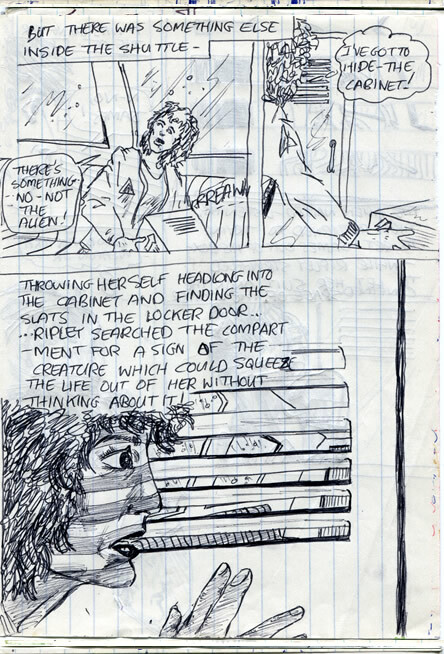 I was getting a bit fancy with the shadows across Ripley's face in this one. In the '80s that became a common element in films. Usually bad ones. '80s style had an art deco element to it but it also looked forward to Film Noir. So you'd get cigarette smoke, ceiling fans and raking light between venetian blinds. But Bladerunner was a good modern film Noir - in colour - substance as well as style. [I've done my best to avoid spoilers here] I don't care what anyone says - even the fanboys: Prometheus is incredible! Gabby and I saw it last Saturday and we were riveted to it. Even she loved it. it's - a - film. 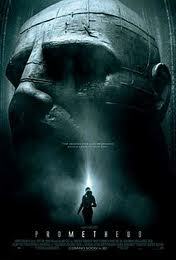 Unfortunately many thought that this would be Ridley Scott's 2001. Maybe Ridley himself is guilty of overstating its profundity and intellectual content? - that it would answer some pretty big questions. I'm not sure because I avoided the interviews as much as possible. 2001 didn't even give any 'answers'. It was thought-provoking entertainment that lived on and grew in the viewer's mind afterwards. 2001 and Prometheus are fiction. Entertainment. Just forget everything. And don't expect a mixture of 2001 and ALIENS either. The trailers mislead me a bit too. The trucks and what appear to be soldiers deploying from the ship, onto the planet give a military ALIENS impression. I'd heard that Ridley admired Cameron's film, so I suspected that there would be a war aspect. I even heard something about 'wars on earth being fought - not between nations - but between giant corporations'. Perhaps much of the negative reaction has been because people expected something different. On discussion forums people were offering their own creative synopses of the plot - before any of us had any idea what the story would be. Some of them were pretty good! Expectations... expectations. Beware. And be open. It's Scott's film, not ours. It's ravishing - beautiful. It's exciting - epic. One of the best looking movies I've ever seen. I had wondered - like many people - if it would be the kind of film that would grow on you over time. But I loved it immediately. So what worries me now is that, like the MATRIX it'll be really dull on a second viewing. That film was captivating because of its stunning premise - and the story. But once I knew all of that, all it had to offer the next time around was FX and dull wooden characters. I knew the 'what-comes-next' and the surprises. Couldn't I then just enjoy the characters and script? No, they were as dull and monklike and monotone as Jedi knights. 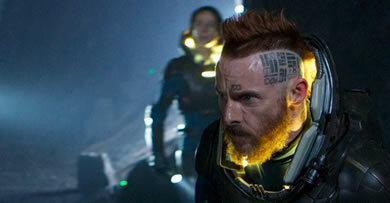 The kind of life that Fifield's performance injects into Prometheus could probably have been brought further. The script could indeed have been better too. Makes me wonder if Michael Fassbender gave some input with his lines - or does he just have the midas touch? Either way, I'm looking forward to experiencing the ride again - and again. Let's hope there's a sequel!